Across the Thames in the shadows of the controversial Battersea Power Station and its resurrection is another development that has also had its share of controversy, Chelsea Barracks. Built in the 1860's to hold two battalions of troops the original brick structures were eventually demolished in the 1960's and replaced by two 13-storey towers for the Guards regiments. The barracks was also the scene of an Irish Republican Army (IRA) bombing in September 1981 killing two people. 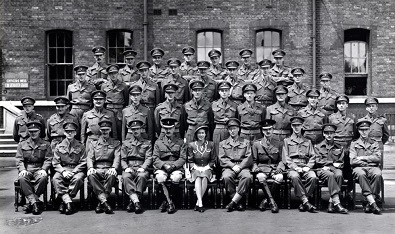 In 2008 the troops were relocated to the Royal Artillery Barracks in Woolwich allowing the Ministry of Defence (MoD) the opportunity to sell the property. On 6 September 2005 Secretary of State for Defence, John Reid, announced that Chelsea Barracks would be sold because of the amount of renovations needed. The original selling price was expected be around £250 million but in April 2007 an agreement was made to sell the site for £959 million to a group consisting of Qatari Diar with developer Christian Candy and the CPC Group. Eventually Qatari Diar achieved 100% ownership after acquiring CPC's joint venture group, Project Blue Ltd. This brought a response from The Times who reported that: "The enclave, between Sloane Square and the River Thames, now has the unofficial title of Britain's most expensive residential development site at £70.3m per acre." However, problems began when property experts claimed that the Qataris overpaid for the 13 acre property and should re-examine their plans. This led to a hold on the proposed £3 billion project, the largest single Qatar investment, with consideration given to perhaps to selling the property without any of the proposed 450 luxury residences and 123 affordable homes the developer agreed to with the City of Westminster borough. The Qataris also agreed to contribute £78 million to Westminster City council's affordable housing fund. In 2009 architect Richard Rogers known for his modernist designs introduced his plans for the Barracks development. One of those not impressed with the scheme was Prince Charles who took his feelings about the plans directly to the Prime Minister of Qatar, Sheikh Hamad bin Jassim bin Jaber al-Thani. Prince Charles described the plans as a "gigantic experiment with the very soul of this city" carried out by "brutalists". He urged Qatar instead to "bequeath a unique and enduring legacy to London". This eventually started a high profile court case in 2010 brought by Christian Candy in which the Prince's intervention was described by the judge as "unexpected and unwelcome". This court case was blamed for the delays in putting forward the plans and in May 2010 some of the project's developers filed an £81 million claim in the High Court. Rogers was ultimately replaced and a new more traditional plan was made and endorsed by Prince Charles' royal aides. 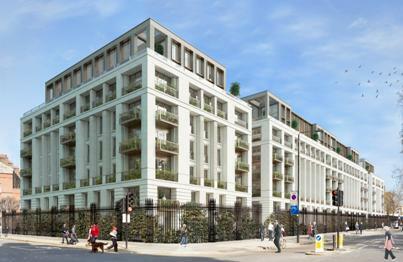 Replacement plans were filed featuring nearly 600 luxury units and were given approval by Westminster Council in the summer of 2011. Claiming the entire project was under review by Qatari Diar no progress was made until September 2013 when a letter was sent to local residents by the Chelsea Barracks Partnership that demolition of the Barracks was planned later that year. In May 2014, Westminster Council granted planning consent for the first phase of the plans. This phase, designed by architects Squire & Partners, will construct 74 apartments across three 8-storey blocks and will include two new garden squares. Many had hoped long before now that the development would be well underway especially for the issue of the fund for affordable housing in Westminster. 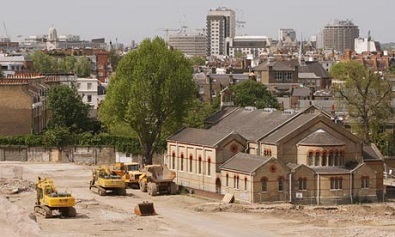 Whist the rest of London saw continuous construction and new plans for future schemes being proposed, the Chelsea Barracks site had remained idle during the 2011 through 2013 period. On a recent visit I made to the site cranes, tractors and crews could be seen working to remove what's left of the old buildings with boarded walls surrounding the entire perimeter of the site. The only remaining part of the original property is the chapel. What is surprising is that Chelsea has always been viewed as one of London's best residential districts with its prestigious SW1 postcode, so the slow pace of moving the project forward left some puzzled. In a 2013 BBC interview former Conservative cabinet member for housing Jonathan Glanz said: "Looking across the site now, there's a huge opportunity to create housing which is much needed in Westminster. We would like to see this moving forward, we would like to see these homes coming out of the ground and we would like to see the benefits that were negotiated by Westminster." In 2013, the Guardian reported one consultant as saying, "I'm not sure anyone outside the Gulf knows [what's going on]. When I ask the guys from Qatari Diar [in London], they just shrug their shoulders. It received outline consent in late 2011 and some work was done moving things forward with detailed designs. Those designs were sent to Doha and that was it. The consultant continued by stating "They paid about £1 billion for the site and maybe that was just pin money to them. It doesn't make sense to me. I look at what is on offer at Chelsea and I think people would snap it up." Too Late to Capitalise on Spiralling Prices in London? A source who until recently had been working on the project said: "It's odd they're not doing anything because the residential markets are really rolling right now." It was estimated that many of the flats in SW1 would sell for more than £10 million, a price bracket that has seen a 40% rise in prices from the market upturn in March 2009 to June 2012, according to the estate agents Knight Frank. The number of sales in SW1 rose by 29% between 2011 and 2012. A recent 2014 report from London estate agency W. A. Ellis indicates that transaction levels in central London's prime property market are down 45% compared to June 2013. The volume of transactions is concerning as the market slows down for the summer months, says the analysis report. Buyers are adopting a 'wait and see' approach for political and economic reasons, said Richard Barber, partner at the estate agency. 'We've seen a 25% reduction year-on-year in sales at all price ranges across our prime central London areas of Belgravia, Chelsea, Knightsbridge, South Kensington, Mayfair, and Kensington,' he pointed out. As with so many of London's development schemes there is opposition. The Chelsea Barracks Action Group has always opposed the plans, saying the buildings will "loom over this very classical part of London". Chair Georgine Thorburn has been quoted as saying: "We quite like it without anything on the site. For all the local residents, we're going to have to put up with five years of building six days a week; it's going to be very stressful. While the site is empty and everything is quiet, quite a lot of people living by the barracks have fabulous views and we like the calm, so long may it last." Like its neighbour across the river Battersea Power Station, whose initial sales of residences were highly successful at £660 million, Chelsea Barracks when completed will also feature retail outlets, restaurants, a sports centre, health facilities and traditional English gardens.